For the past four decades, capitalism has been slowly committing suicide. The stock market has become the yardstick of the nation’s financial and economic health: we assume that stock prices measure the well-being of corporate and business success. This is the world where the shareholders have come to demand maximum, short-term returns. Nearly four decades of this version of capitalism is damaging the long-term viability of businesses and has helped create a vast, unequal America in socio-economic terms. Opportunity has disappeared because free market capitalism has been hijacked. Our system thrived in the 40s through the 1970s, when America became the greatest engine of prosperity in the history of the world. In the late 70s, that began to change as we narrowed our vision and started to focus solely on rewarding shareholders. As a result, we are seeing the loss of economic and social opportunity for all but the wealthy segment of our nation. 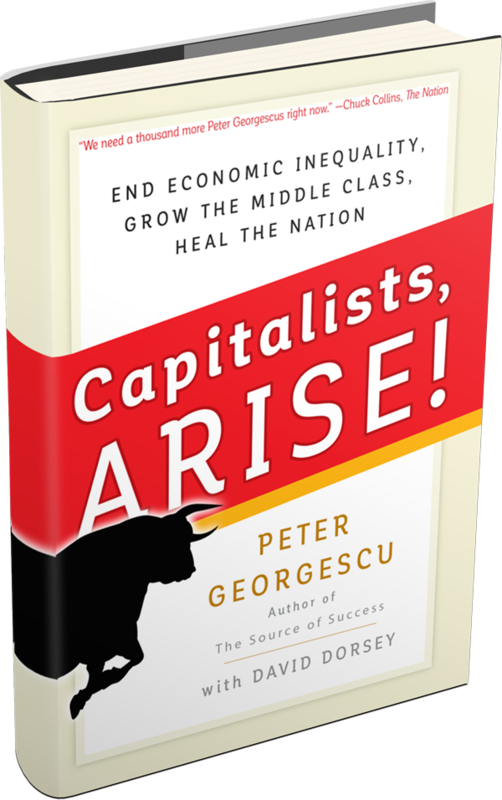 What we desperately need now is not to abandon free market capitalism, but to correct its vision: to restore its broader sense of responsibility to multiple stakeholders, to our society as a whole. Corporate profit margins are at an all-time high, even though the economy has almost stalled, and wages have barely kept up with inflation. Despite the extraordinary rise in income and wealth for the top quarter of income in America, the median household income is less than 1% higher than it was in 1989. 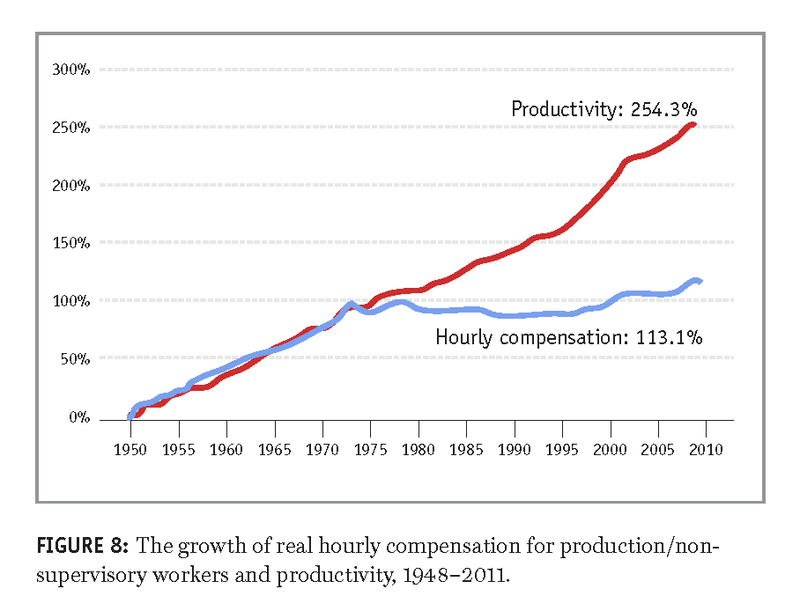 Wages have stayed flat, or have declined, since mid-1970. 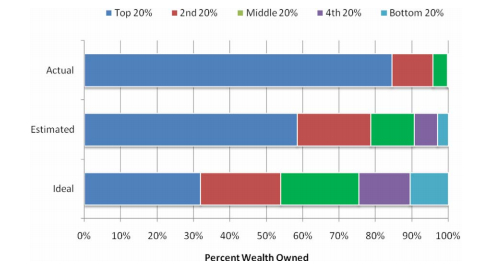 Since the 2008 financial crisis, 91% of income growth has gone to the top 1% of earners. Nearly 60% of the population is staying afloat through deficit spending – to put eat and to pay their bills, they have to borrow money. 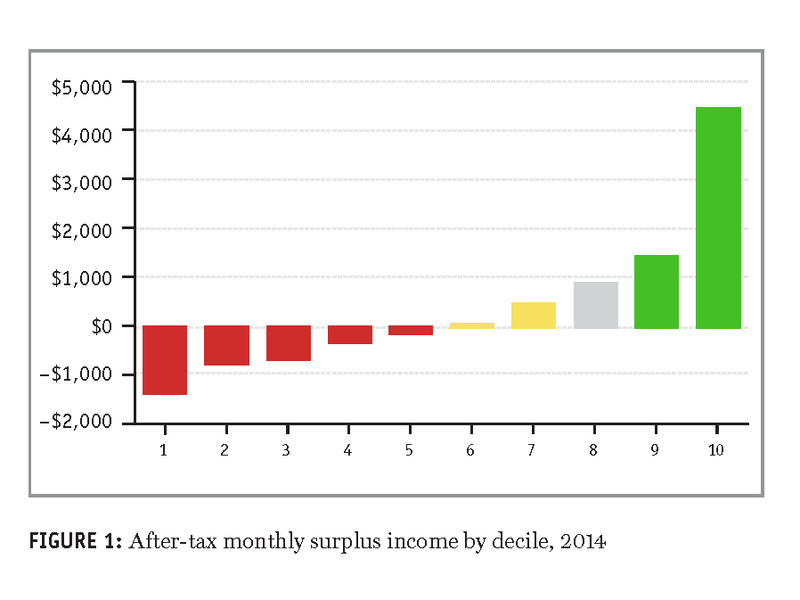 This is a measure of what income arrives in the household every month against what monthly bills, of any kind, have to be paid, including taxes. We don’t have “extreme poverty,” like some developing nations, but half of our population is sliding toward insolvency. At the current rates, the bottom tenth of the population will dig itself a staggering $15,000 deeper into debt every year. The second to last segment adds more than $9,000 to its debt each year. At this rate, roughly a third of the nation’s households will eventually default. America ranks highest for immobility and inequality among developed nations. We have become the Land of Lost Opportunity. 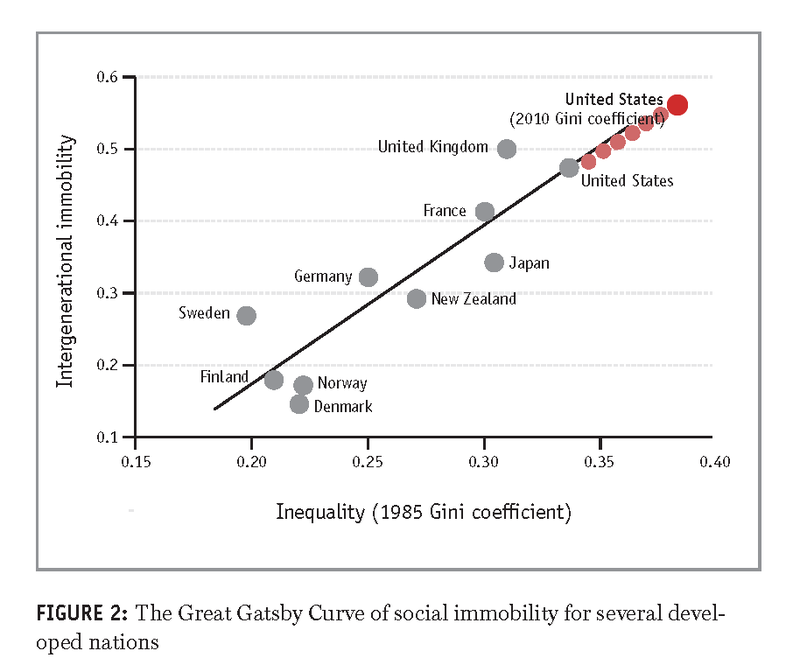 Four decades ago, America offered the greatest social mobility in the world. Now, it’s bringing up the rear of the developed nations. There are few chances to move up the social ladder. Aside from debt, this is probably the most troubling measure of our economic health. The vertical axis in the Gatsby Curve shows social immobility from one generation to the next: the likelihood that someone born into an economic class will remain there for a generation. We rank highest for immobility and inequality among developed nations. The extraordinary creator of wealth—free market capitalism—no longer works for anyone but the people at the top. On a global basis, the world has made extraordinary strides in reducing poverty. A phenomenal accomplishment for mankind—and free market capitalism, which has driven the rise in quality of life almost everywhere. Here in America, at the moment, it has slowed to a crawl. In the past, it offered the rest of the world a beacon of hope for a better life. It built the strongest, most affluent middle class in world history. Now the middle class is dying along with real capitalism. Companies have to recognize that their workforce, the employee, is the source of success–not simply another cost on the income statement. First, invest in the actual value creators—the employees. Start compensating fairly, by which I mean a wage that enables employees to share amply in productivity increases and creative innovations. Second, businesses must invest aggressively in their own operations, directing profit into productivity and innovation to boost real business performance. Some businesses are already effectively applying these principles, with great success.